Portimao is a sailor’s delight, thanks to its calm waters and beautiful conditions. It is the biggest town in the western Algarve and it is now being discovered by cruise ships from around the world all over the year. Plenty of elite international competitions also happens here, but you don’t have to be a professional to set sail and on dry land, there is plenty to do and discover too! If you are seeking a unique and original way to explore the city and its surrounding, like the beautiful beaches, the green side of the Algarve in Monchique, a rich and varied cuisine, internationally award-winning wines, all with a different perspective, away from the hustle of crowds, you will want to try a lovely private sidecar tour. Just consult Tripadvisor and check that this experience is already in the Top 3 of the Outdoor Activities in Portimão. And Portimão, is ranked #6 of the Top 10 Destinations in Portugal. There are plenty of bars, restaurants and café’s where you can sit for a bite to eat or a drink and watch the town carry on around you. Portimão’s atlantic beach of Praia da Rocha has, over the years, become a resort in it’s own right with lots of hotels and apartments, restaurants, bars, discos, clubs and shops. 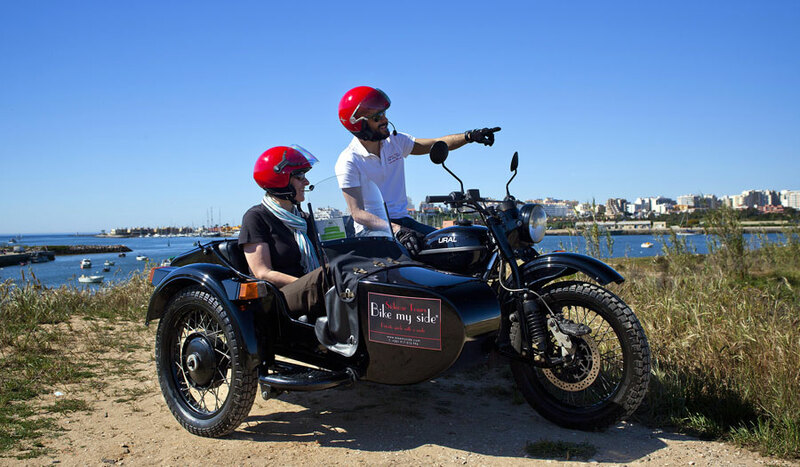 Before saying goodbye to your private sidecar guide, receive a discount entry voucher to Portimão Museum — perfect if you want to delve further into Portimão’s history following your tour.